I give permission for my child to go on supervised walks outside the building within the general neighborhood. Please provide a brief description of the allergy. Does your child have a prescription for an Epipen or other life-saving medication? Please upload a Special Health Plan signed by your child's doctor for the 2018-19 school year, along with the Epipen and/or medication to be kept at the Religious School. Is there any pertinent medical information regarding your child that we should be aware of? Does your child have an IEP or any educational needs that we should be aware of? Would you like information regarding membership? Are you members of any other congregation? Please click here to view our CAI Religious School Tuition and Registration Agreement. Please check this box to confirm that you have read and agree to the terms and conditions of the CAI Religious School Tuition and Registration Agreement. *This is required to complete your school registration. 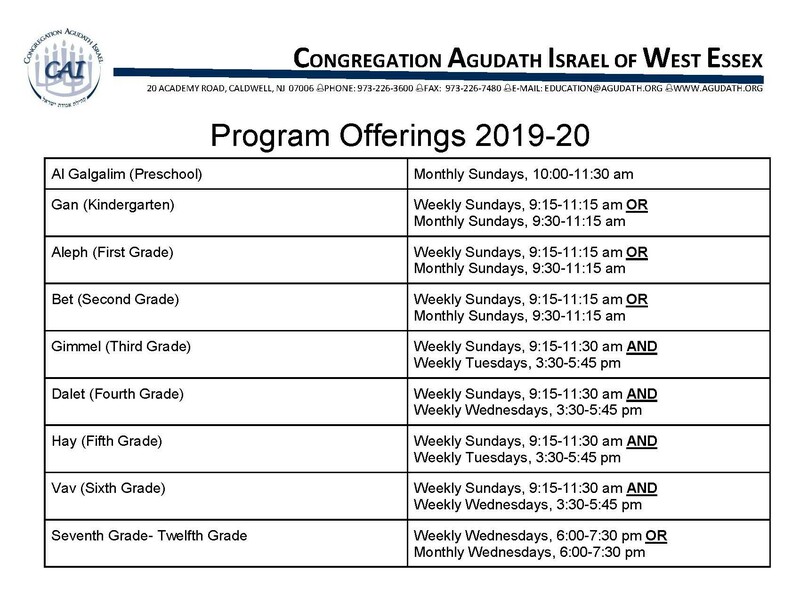 Welcome to Congregation Agudath Israel’s Religious School Registration for the 2019-2020 School Year. Our outstanding staff and the dedicated lay leaders who serve on the education cabinet are committed to bringing to “every age and stage” of learners a wealth of opportunities to connect to our sacred tradition. Our education goals are inspired by the CAI mission of creating programming paths to Judaism through diverse gateways of Friendship, Learning, Spirituality, Social Action, Israel, and Volunteerism. We consider ourselves guides who are privileged to teach, inspire, and direct our learners and their families on their journeys of discovery. The goal of the CAI education department is to create life-long Jewish learners who will be engaged in the Jewish community, contributing their insights and wisdom to our people’s legacy. We are all links in the chain of Jewish tradition that began thousands of years ago, and we welcome you to join that chain and be part of its growth and strength from generation to generation! We are pleased to offer a discounted registration fee to families that REGISTER ONLINE with a $75 non-refundable registration fee by May 15, 2019. After May 15, 2019, the non-refundable registration fee will increase to $100 per child. Our 2019-2020 tuition options can be viewed here. Please do not hesitate to reach out with any questions regarding your child’s Religious School Registration. We look forward to a wonderful year of learning together.